I don’t take for granted that women fought long and hard so that we could drag our butts to the polls. So that we could have a voice…some sort of say in our lives, now and in the future. Please go vote y’all and have your say! As I read on Twitter this morning: don’t let today’s lazy become tomorrow’s crazy! 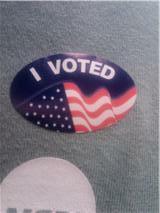 And…the sticker! I luv the sticker! Now go handle your business! P.S. 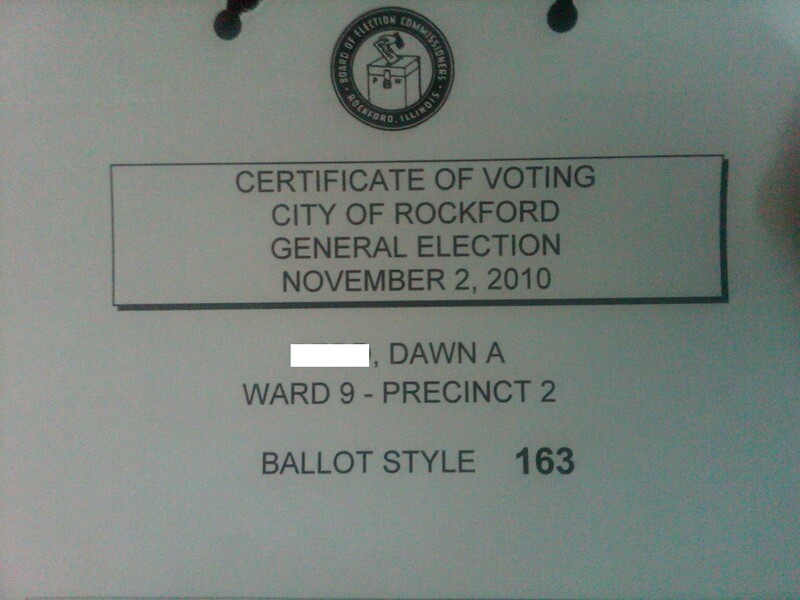 I was worried about voting with the recent name change and all…I had NO problems! I was in the system and was good to go. So I was visiting Simple Marriage’s blog today and saw this picture and it made me giggle. He’s got a series about stripping away the unnecessary and focusing on the bare essentials…but I wondered what I could come up with for captions for the picture. Chica: Ummmm, could I get a leaf that’ll cover my ta-ta’s please? Chica: *to Dude* I see that leaf of yours is at attention…don’t even think about it! Both: Why are our heads so ginormous? Dude: *to Chica* The next time we go for a run, maybe we should put some clothes on! Both: Oh my goodness…there’s Sue and Jared, close your eyes and pretend like we didn’t see them! So do you have any captions for this pic? Hit me up in the comments! I was listening to NPR the other day and they were talking about those Chilean miners that are trapped underground and probably won’t be rescued for three to four months. Aside from the sheer awfulness of being trapped without light, stuck underground with strangers, and not having any privacy (I can’t bring myself to think about the bathroom situation), they talked about how their families are handling the situation. Of course they were elated when they found the men alive and were able to establish contact with them, but then they got to worrying about the mental state of those poor men. Let’s take a break in the action so that I can take this moment to speak directly to The Mister: please stop reading. Seriously, I think it’s super sweet that you subscribe to get these posts in your email, but you’ve got to stop reading. Right. Now. Really. For real. Close it and send it to the trash. Okay, now that I’ve taken care of that bit of business, back to the Chileans. The NPR lady then interviewed their families and so many of them were feverishly writing letters to their husbands, boyfriends, and brothers in order to keep their morale up. Then I thought…what if I did the same thing? What if I started writing The Mister letters everyday to tell him about my day, and how much I loved him, and how I just couldn’t imagine my life without him? I mean, if he were trapped in a mine…or just gone for a long time, I’d probably do it. Why should I wait until something awful happens in order to try it out? The miners’ families talked about how close the writing made them feel to the men because it took time and you really put more effort and heart into it than you would an email or text. I’m going to try to do it everyday…we’ll see how good I get at it and I’ll keep you guys updated. What do you think? Is this a crazy idea or what? So I’ve never been one to have tons and tons of friends. I’ve got folks who’ve been in my life for years, but mostly from times when I was forced to be around strangers and interact…like college and right afterwards when I was too poor to live by myself. Those strangers I was obligated to be around because they were my roommates are now some of my best friends, so you would think making that connection would make me step outside of my comfort zone more often in order to meet people. But it doesn’t. Why? Because I’m an introvert. I enjoy being by myself. All of the things that I would consider “fun” can be done all by myself: reading, writing, blogging, farting around on the internet, running, lifting weights, etc. I was so excited to receive my Psychology Today in the mail yesterday (what? you don’t subscribe?) and the main article is about introverts! Yippee!! Finally some validation that I’m not a crazy person because I’m internally rather than externally motivated…which, in fact, is what introvert and extrovert means. I haven’t read the article yet, but I’m sure you’ll be hearing about it when I do. I know that I need to get motivated and try to meet some ladies, but whenever I have that thought it’s always followed by a heavy sigh, lol! It just sounds like so much work. I did meet a lady at work who sounded pretty desperate for human interaction and I immediately thought, “score, surely she’ll be my friend!” It’s still up in the air, but we had her over to the house about a month ago and she still hasn’t called me back. I just don’t think she was that into me. What advice do you have for me to get some girlfriends? Homeless people with dogs. I went to Walgreen’s the other day and there was a dude outside who was clearly homeless asking for money…and he had a dog sitting next to him with a little water dish and food on the ground. Seriously? So you can’t take care of yourself, but you can take care of a dog and you want me to give you my loot? Try again, partner. People wearing camouflage. Are you off to war? Are you huntin’? If your answer was no to both of those questions…I just don’t understand. Wear skinny jeans. I’m not a big person, but I sure look like one in those jeans! When I see them on other ladies, they’re so cute…on me, they’re fatty jeans. Dance like the people on So You Think You Can Dance. They’re amazing…I really love that show. They’re such well-trained and amazing and skilled dancers…awesome! Plus they have to take such risks week after week, it has to be hard and thrilling all at the same time. Not get tickled during a pedicure. I love getting my toes done and the massage and just having someone else dote on me. Until they get to that part where they scrub the bottom of my feet. Then I’m making faces and trying not to squirm…and I’m pretty sure the lady doing my feet laughs at me on top of everything. Health. I know it sounds cheesy, but so many things can go sideways in this lifetime and I’m blessed to be basically healthy as a horse. Beer in the fridge. When I get home, I’m cracking on of those suckers open…I’ve been working like a field slave around here and it’s time to get a tasty beverage. Other marriage blogs. I don’t have a ton of married homies, so I’ve learned tons from other ladies online…y’all are the best! Anything you want to add to any of the lists? Who feels like the only one. That quotation is from one of my favorite songs and it always gives me tingles to hear it because so often, we feel like we’re the only one’s thinking certain things, or feeling certain things, or worried about those things. And as much as we feel those things, we don’t talk about them. We stew, we mope, we agonize…but we don’t talk. So I wanted to talk a bit about things that have vexed me over the different stages of my life. Single: I remember worrying that I’d never meet anyone who “got” me…who not only tolerated my quirks, but embraced them. I remember thinking that I would never get married and trying to wrap my brain around that…but I was too embarrassed to actually talk to anyone about it. Then I remember fighting those thoughts off by openly admitting that I did want to be married. Lo and behold, a got introduced to The Mister and the rest is history…the man who God brought to me. Engaged: So I finally met a great guy who understood me and loved me, then I started worrying about the wedding. I’m sure everyone does the same thing when they first get married: go buy up a mess of bridal magazines and go online and look up weddings in order to get ideas. Those are the places where I first learned to feel inferior about the wedding we imagined and looked forward to…because it wasn’t nearly fancy enough. Then I felt comfortable being the anti-bride and not falling for “the man’s” idea of what a wedding or bride should be…or so I thought. Then I fretted over not wanting to do DIY projects and not recognizing gays in some meaningful way at our ceremony…because that’s what the cool brides were doing. *sigh* In the end, our wedding was so much fun and it was touching and memorable in our own way. Turns out all of the worry was for nothing, but I probably could have save myself from it in the first place by just talking about it. Married: Obviously I haven’t been married long enough for this list to be super long, but I will say that I worry about sucking at being a wife. I pray every morning that I’m the wife that The Mister needs me to be. I’ve seen so many bad examples (wives yelling and belittling their husbands, couples fighting, husbands cheating) that I’m pretty energized to not be those people. I want him to look forward to coming home, not “work late” so that he doesn’t have to hang out with me like some of the dudes I know. I want the two of us to create a home that is comfortable and welcoming…for us as well as others. What about you? What are those things that you’ve blown up to be a bigger deal than they should’ve been because you worried yourself to death? So I forgot to wear my wedding ring to church yesterday…and it felt weird!! I kept touching my finger and looking down to realize (again) that I had indeed left it at home. Usually when I forget it, I go back home and put it on. But yesterday we were running shamefully late for service and I couldn’t justify going back. Here’s my little secret…shhhh, don’t tell anyone. But I love the way my ring looks at church and I have to remind myself to focus on the task at hand sometimes. The lights hit it just right and that ring just beams and shouts to the world: Woooo hooooo!! The Mister loves Dawn!! So I was bummed that I couldn’t sneak peeks at it during church, but also that folks would wonder about our PDA. Y’all know church folks and if you give a man an extra long hug, and he’s not your husband, you get the side eye. And sometimes the side eye with the head shake…it ain’t pretty. Oh well. I like to sit close and put my (ringless) hand on his leg, so I’m sure I got lots of extra prayers from strangers yesterday, lol! Have you forgotten your ring yet? Doesn’t it feel strange? Tell me about it!